Thank you for your interest in our vacation rental. 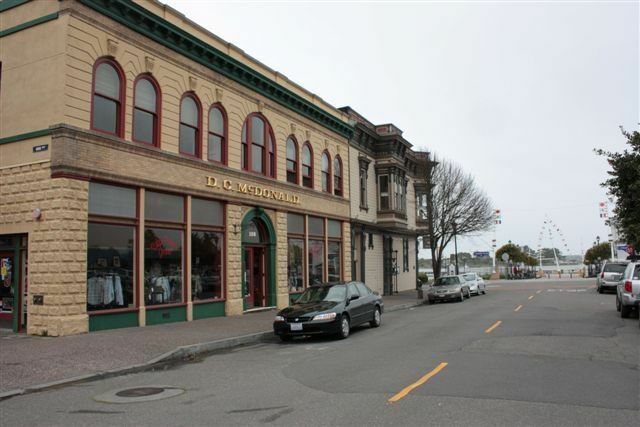 We have a comfortable 1 bedroom/1 bathroom condo located above 108 F St in Eureka, on the waterfront in the Old Town district. The vacation rental is on the second floor of a historic Eureka building, there is no elevator available in the building. This location is in the center of Old Town half a block to the waterfront to the North and next to the Gazebo to the South. The bedroom has a king size bed. The living room has 2 comfortable leather chairs, a leather couch and a flat screen television with DirectTv. The condo has 6 large widows giving plenty of natural light and views of the waterfront and Old Town. In the kitchen you will find a full selection of cooking pots and pans and basic cooking tools to help you out. There are dishes and glassware for 4 guests, even the martini glasses; of course there is a built in microwave oven and dishwasher. One of the great things about Old Town is that when you walk out the door you have the choice of many restaurants, coffee houses and a couple of local bakeries. During the spring and summer Old Town has its on horse carriage to take in a very unique tour of Old Town. Marty and his horse Cinnamon can be seen out the South window where they pick up passengers, look for them in our pictures below. Vehicle parking is on-street. Eureka is a city of almost 30,000 located on the Pacific North coast of California. We have an active arts community with a monthly Arts Alive Night on the first Saturday of each month in Old Town, there are also many local art galleries for viewing or purchasing art. Humboldt State University has its own gallery in Old Town on First Street with student and faculty exhibits and out of the area artist shows. There is a wide variety of restaurants to be found in Eureka and we would be happy to give you some ideas of how to choose your meals out. In Henderson Center there is a great local bakery for morning pastries and coffee drinks. Humboldt County has a bounty of outdoor activities to be enjoyed at our local beaches and forest areas. Eureka is a 4 hour and 45 minute drive north of San Francisco and 120 miles west of Redding. Whether you want to escape the urban population of the Bay Area or the heat of Redding, Eureka is a great choice. Over the last 4 years we have converted 4 of our long term rentals in Eureka to vacation rentals. We have lived in Eureka all our lives and enjoy sharing our community with others. We manage our own vacation rental so you can be assured that you will be interacting with the owner of the property instead of a third party property manager. Thank you for looking at our property for you possible stay in Eureka. Have a safe trip. The vacation rental is located half a block from the Waterfront. The view to the North is of the Waterfront, the view to the South is the Old Town Gazebo. Located on the second floor with many windows the vacation rental is a great place to take in the view or do some people watching. Walk out the front door and there are many restaurants and shopping establishments to choose from. One time set up provided with rental. Coin op washer shared with one other unit in building. Coin op dryer shared with one other unit in building. We couldn't have asked for a better location. The apartment was right in the middle of old town Eureka facing the square from one side and the marina/waterfront from the other. We were able to walk everywhere in the old town and beyond which was wonderful. The Eureka Coop is just a few blocks away and an easy walk for groceries. There are many good restaurants in the area and a lot of shops as well all within walking distance. The apartment is very nice and comfortable. Due to the full size kitchen, we were able to prepare meals in-house some of the time which helped our waistlines and our wallets! There is a farmers market right outside the front door on Tuesday mornings and the kitchen allowed us to take advantage of all that beautiful, fresh produce. The space had plenty of room for two people and it was so much better than being stuck in a one room hotel. Joe and his sister, Delores,are very nice people and also very accommodating. While there, I had some important paperwork that had a tight deadline and was able to have it FAX'd from Joe's office which is right around the corner. Both of them were more than helpful offering suggestions on things to see and do around Eureka and responding immediately to our questions/needs. I've seen reviews in which people complained about the homeless population in Eureka. Yes, there are many, but not once were we approached or asked for money during our five week stay. Hope to stay again in the future. Thanks for everything, Joe and Delores! This was the second time staying here and it’s been just as clean, comfortable, and relaxing as the first time. It actually felt like home. This is a great place! Great apartment, with wonderful views. This was a great place to stay in old town Eureka. Views of the harbor and the town square just below us. The apartment was nicely furnished, with a very comfortable King bed. Joe was a wonderful host and took extra time for us. Everything in old town Eureka is within walking distance, including the Carson mansion. Would highly recommend staying here. I spent 4 weeks in this apartment and had a very nice stay. Furnishings were fine, and kitchen had everything I needed to prepare meals. This was an excellent location right in the heart of the Old Town District, so easy to explore places on foot. I enjoyed sitting by the open window (in August!) to read and look out on the plaza in front of the building. I did hear some street noise, as this is a popular spot for pedestrians with shops, galleries, restaurants, etc., but I found that to be part of the appeal of the apartment. Property manager Joe works right around the corner and was easy to reach if I needed anything or had a question. I hope to stay in this place again. I loved the cool weather, away from the mid-Atlantic heat and humidity. I'd never been to Eureka before, and it was everything I hoped for and then some. Looking for a place in Northern California, the two of us were happy and satisfied as we settled in here. Some days we left to explore the redwoods, coasts, towns, and shops. Other days we stayed nearby to relax, enjoying local restaurants, galleries, and museums, taking a boat trip, shopping the Tuesday market, and going to the theater. Aways the condo was a comfortable and well equipped home base. The Old Town location is the best area to stay in Eureka. You can choose this with confidence in what you are getting." I highly recommend this rental if you will be staying in the area! In the center of Historic Old Town, this apartment is in walking distance from all kinds of shopping and some very nice restaurants, especially if you love oysters. If it's a view you seek this place has it. The boardwalk is just a hop skip and a jump away. If it's adventure you seek there are a ton of places not far away that you can drive to and take in the beautiful views of the Pacific Ocean and the Redwoods of Norcal. Most importantly the apartment is pet friendly, very clean, well kept, private, secure, spacious, and well equipped with everything I needed for my extended stay. The owner, Joe, was absolutely wonderful! Not only was he quick to get back to me when I had some questions but he was polite and friendly on top of it.